This highly useful accidental damage insurance protects devices from unexpected incidents. Thanks to this agreement with MAPFRE ASISTENCIA, Samsung expects to sell around 2,500 units in Lebanon in the next six months. The product was recently presented during an event organised by Samsung CTC, the brand’s distributor in Lebanon. 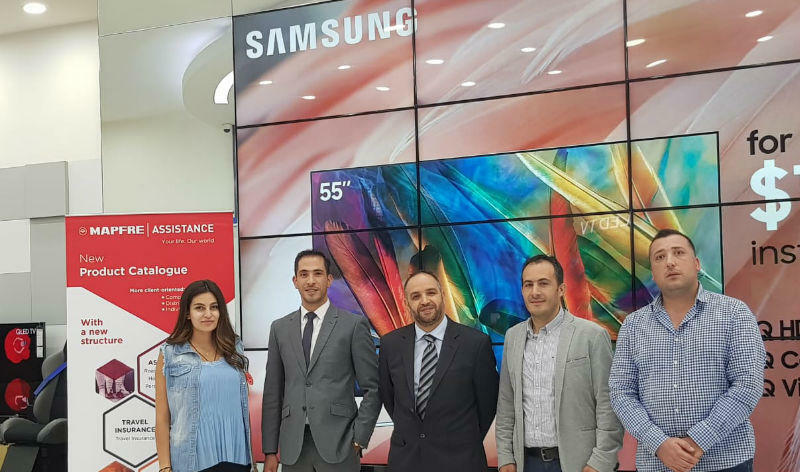 Moez Bergaoui, Commercial and Marketing Director for the Middle East, and Mohanad El Masri, Commercial Manager for its East region, attended the presentation of the new accidental damage coverage for the Samsung Galaxy S9 and S9+ mobile devices. With this agreement, MAPFRE ASISTENCIA shores up its position as a benchmark company in the assistance sector, offering new products that ensure clients’ safety and comfort. Operating in the Middle East as MAPFRE Assistance and MAPFRE Warranty, we are specialists and leaders in global Assistance, Vehicle Protection and Lifestyle solutions. We are part of MAPFRE ASISTENCIA, owned by the global insurer MAPFRE, founded in Madrid, Spain in 1933. MAPFRE ASISTENCIA is directly present in 38 countries. With 1,250 corporate clients and over 100 million beneficiaries, we provided assistance in 10 million cases in 2017.